Publisher: Nancy Paulsen Books, 2017. 243 pages. 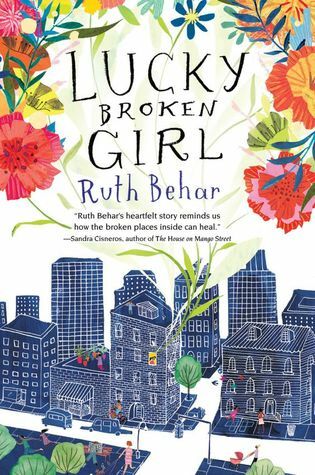 This was a lovely story, and I think the blurb leaves out the biggest part of what it is about: Ruthie learns that she has to be strong and determined if she's going to do anything. Yes, she learns about those things that make her confinement bearable, while she also learns that parents are human and the demands her injuries make on her mother are a strain. But she also learns that she can only recover if she is willing to work hard, bite the bullet, and push herself. The book shows us her journey from sullen resentment of her situation to an embrace of her helplessness, to a place where, finally, she can fully recover because she's willing to try. It is particularly important, I think, that Ruthie's journey isn't a straight line, and isn't always in the same direction. She gets angry and frustrated and gives up and then tries again, then backslides... In short, she is remarkably human (maybe because the author is writing from her own experience, she seems to have a better than usual grip on the reality of how a person processes something like the accident that changes Ruthie's life). The story is compelling precisely because it's sometimes challenging. This is good for kids from about 8 up. Older children will probably get more out of Ruthie's journey, but younger ones can enjoy her struggles and successes. I have to also say: I had no idea there were Jewish Cubans, families who migrated there as WWII was heating up in Europe (maybe because the US wasn't too open? The author doesn't go into that). It gives Ruthie's family some interesting twists, and makes for a good reminder that people aren't always just what they seem, or what you expect. FTC Disclosure: I checked Lucky Broken Girl out of my library, and received nothing from the writer or publisher for my honest review. The opinions expressed are my own and those of no one else. I am disclosing this in accordance with the Federal Trade Commission's 16 CFR, Part 255: "Guides Concerning the Use of Endorsements and Testimonials in Advertising." I love the title and I'm pretty sure that I saw it last year. I love the 1960's since I grew up in them and am Jewish. I'll be curious to read this to see what Ruthie's experience was. Thanks for sharing it. Yes, the title caught my eye, too! I'm another child of the 60s, but in such a different place and circumstances that it doesn't feel like the same era at all! Posting today at Tick Tock!